I would be remiss if I did not acknowledge the fact that my blog title can become oxymoronic in certain contexts. For example, it takes much less time throw away meat scraps and partial vegetable packages and leftover rice than to preserve them safely before putting them to good use. Home cooks might find the day flying by, but in general, we can afford to spend a few minutes finding a plastic bag or sealed container and adding a label. In restaurants, however, minimizing waste is a low priority. Two weeks ago, I participated in a faculty and staff cooking competition at my place of work, organized by the food services division and held for an audience at the on-campus conference center. 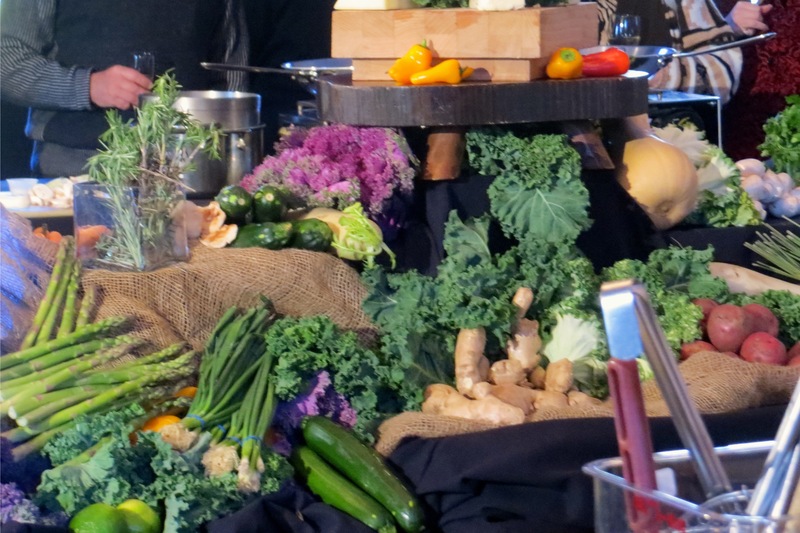 We had applied in teams of three, and upon arrival each team was given a different basket of several items with which we were to make an appetizer and an entree. There was also an extensive pantry of fruits and vegetables as well as spices and oils. The clock was set for 90 minutes. At the 45 minute mark, we had to present our appetizer, and at the end, our entree, to three judges. Our basket contained: pork tenderloin, bacon, shrimp, fennel, brussel sprouts, spaghetti squash, and purple potatoes. Our setup was a table with two nice gas burners, two frying pans, a cutting board, some utensils, a couple of sheet pans and mixing bowls, and two tubs underneath the table, for trash. The ovens were nearby at a different table, and there were grills and a sink outside for washing pans and dishes. Conference center staff was walking around to provide us assistance with equipment, and to make sure no one got hurt. A portion of the “pantry” of additional ingredients. 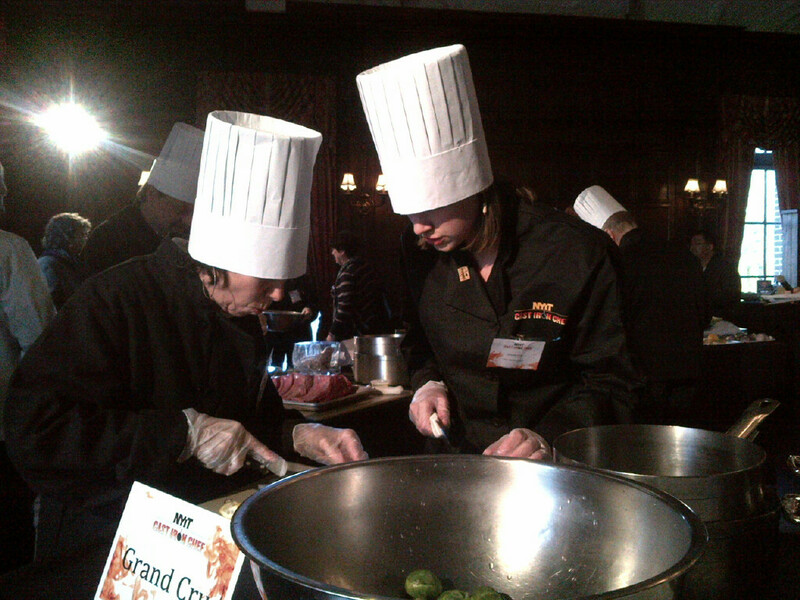 The 90 minute challenge might be fairly easy for experienced cooks or chefs. But when the clock started, I was stressed. Eventually we figured out what to do, starting with an apple-fennel slaw and marinated shrimp in an endive spear. Then I took on the pork, which I wanted to rub with spices and roast in the oven to keep it tender. The package had two pieces, and I knew the judges’ plates only needed one slice each, seeing how with appetizers and entrees from four teams, they might only be taking one or two bites anyway. What was I to do with the other loin? I felt a serious twinge of discomfort putting the perfectly good piece of meat in the garbage bin. I had no real time to ask questions, because part of our score was station cleanliness. So perfectly good shrimp, a quarter of a bacon package, and two-thirds of a piece of fennel were quickly dumped in the bins underneath the table, mixed with our used tasting spoons, dirty dishes, and other garbage. Sharing a cutting board and contemplating brussel sprouts. It reminded me of the story I heard on NPR last November, which mentioned the waste reduction efforts of a company called Leanpath. The idea is that food waste is harmful in several ways: it fills dumpsters, then fills landfills (food is the number 1 material there) where it generates millions of tons of methane, a greenhouse gas, and it wastes millions of dollars, both money and resources spent to grow the food, and money to buy it. Your $100 grocery bill? Go ahead and throw $3 in the trash. These are alarming statistics, many of which are nicely laid out by Leanpath here. Leanpath works to save restaurants money by having them monitor their food waste using a scale and tracking software–a definite investment in time. The company’s featured successes have been at colleges and medical centers, but in the NPR story, the Chef at Lupa Osteria Romano, a restaurant in Manhattan, decided to abandon the system to save time for the kitchen staff. 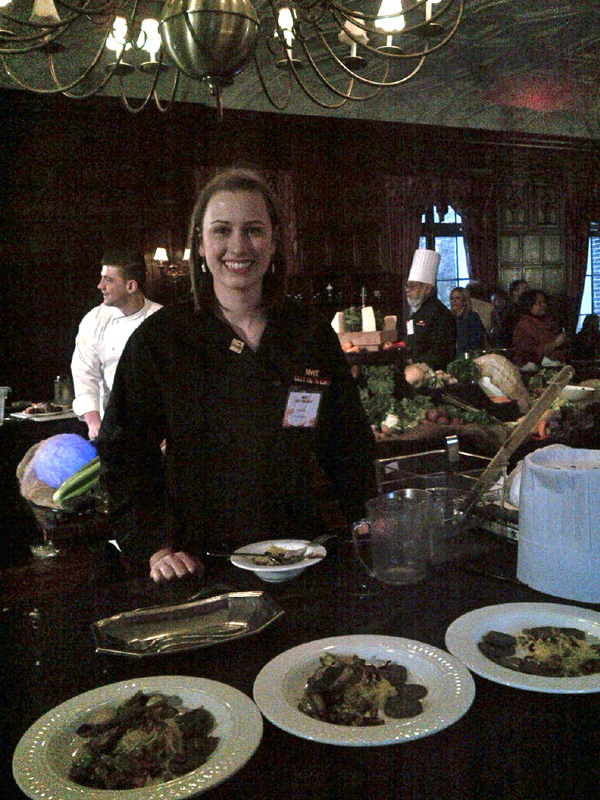 A grainy picture of me with my team’s entree offering, which didn’t look fantastic even in better lighting! Like Leanpath, I am holding out hope that food waste tracking becomes a priority for restaurants. I won’t count on being given extra time at my next cooking challenge. But perhaps customers will start to understand the extra minute or two they wait to receive their fresh pasta.